← Is growing as Disciple of Jesus more like learning to ride a bike or to drive a car? Bill had always found it difficult to make friends, especially at school. He didn’t feel very clever and he wasn’t even good at sport, he felt like a nobody and it seemed like everyone treated him that way. Life had been incredibly lonely for Bill but all that had changed when Pete joined the school and soon they became the very best of friends. Pete’s father had sent him to the Bill’s home town to attend the school. Despite their separation, Bill soon noticed the special bond that Pete and his father had and the way that they often talked on the phone several times a day. Shortly after he had arrived, a video recording from Pete’s dad saying how proud and pleased that he was with his son was played in an assembly. It provoked quite a reaction from the other students, after all people pupils were only ever honored in an assembly if they had achieved or had done something special. In contrast, this message from the father spoke of love and being pleased with his son simply because that is show the Father felt about his son and he wanted everyone to know it. Bill was intrigued by the special relationship that Pete had with his father! Pete seemed to draw acceptance, security, strength, guidance and a purpose from his father and Bill noticed that all of these elements were also found by him in his friendship with Pete. Pete and Bill were inseparable, they learnt together, they laughed together, they shared hopes and dreams and they even talked about the things that were worrying them. When they left school, Bill went to work in an office while Pete continued to spend his time befriending people – he didn’t get paid for it but his father always seemed to ensure that he had enough to live on. They continued to meet up and speak each day and Bill was grateful for the fulfillment in life that he had found through their friendship. Several months later, Pete told Bill that he was going home to his father and that one day Bill could come and live with them, but that it wasn’t time yet. When Pete left they stayed in touch by phone (in much the same way as Pete and his father had done). It seemed strange at first but while they talked regularly, Bill felt that Pete was still with him and so their friendship continued. A few weeks later, work was so busy that Bill forgot to phone Pete. His mobile phone had rung several times and although he could see it was Pete, he really didn’t have time to answer and in the end he switched it off as it was distracting him. Bill phoned the next day and apologized to Pete who said that it was okay and that he was always available anytime that his friend wanted to call him. Sadly that was just the start! Bill got complacent about contacting Pete and he was so busy that he often didn’t switch on his phone for days. Bill rarely phones Pete now which is sad because Pete is always ready and waiting to talk with him. Is there anyone that we should call? We may say that we follow Jesus, but how much do we talk with him? Do we need to deepen our relationship with him by speaking with him more than we currently do? This entry was posted in acceptance, creative communication, discipleship, Faith, Following Jesus, Jesus, Listening to God, Prayer, Relationship with God and tagged Christianity is about a relationship not a religion, discipleship, friend of sinners, God wants to talk with us, I call you friends, Jesus friend of sinners, listening to God, modern parable, parables, prayer, prayer is simple, relationship with God, talk with God, talk with Jesus, talking with God, what is a disciple, who wants to talk to dad. Bookmark the permalink. 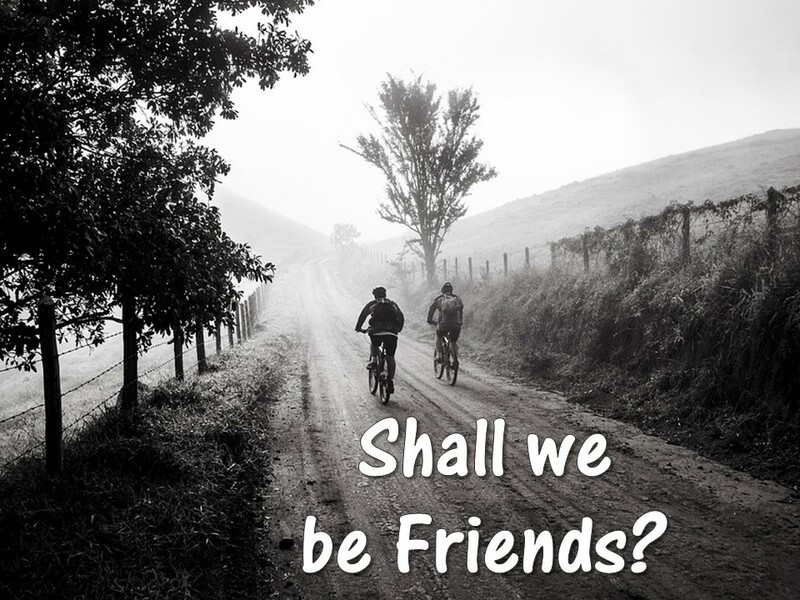 1 Response to Shall we be Friends?